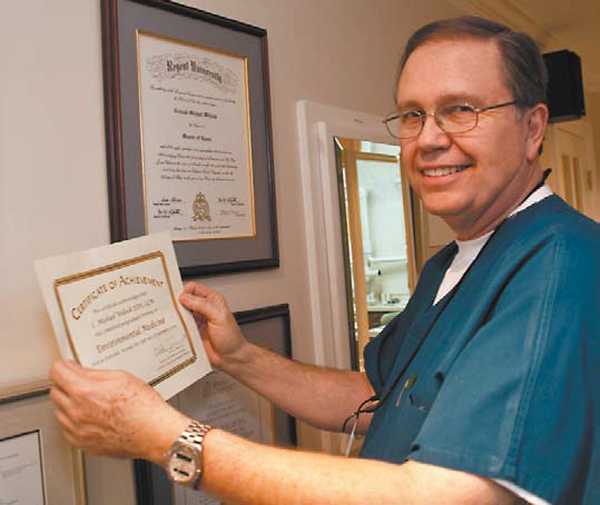 Dr. C. Michael Willock, one of the area’s leading holistic dentists, is rightly proud of a certificate he has just received (see photo) for completing a 83- hour post-graduate course in environmental medicine for the health care professional. Dr. Willock spent many hours on airplanes over the past year to complete the course requirements at the Southwest College of Naturopathic Medicine, in Scottsdale, Arizona. “Of particularly great value to all of us in the course was the bringing together of physicians and dentists,” notes Dr. Willock. “We have a lot of common interests that are too often not understood or acknowledged. Dr. Reinhold Voll of Germany concluded after years of study that 80 to 90 percent of systemic health problems are either caused by, or influenced by the oral cavity—the teeth, tonsils, and sinuses. Clearly, contrary to common beliefs, there is a powerful connection between overall physical health and oral health. “So dentists and physicians have a great deal to learn from one another. The course on environmental medicine had a strong focus on toxicology. It was an amazing, eye-opening experience to gain understanding of the depth and vastness of the toxic substances that invade all parts of our lives. “In this course, we focused on an array of related topics: outdoor and indoor air pollution, food pollution, genetic polymorphism, the role of nutrients and bio-transformation, the natural history of environmental illnesses, chemical sensitivities, and the impact of such heavy metals as mercury and nickel and cadmium— metals commonly used in dentistry. Dr. Willock notes that “I often see patients in my practice who not only have dental needs, but also have systemic health issues. Based on the knowledge I’m acquiring, I can guide them to physicians who have the understanding to test for high toxic levels. There’s always a good reason why the body gets sick—it never does so capriciously—but often illness defies a label, and thus it becomes difficult to treat in traditional ways. Fibromyalgia is a classic example of such an illness. “In this course in environmental medicine, I learned that there are disease-provoking toxins everywhere. One of the critically important sources of toxins is the mercury in amalgam tooth fillings, and rarely a day goes by that I’m not asked by a patient to remove these fillings. Often the result is a noticeable improvement in health. Dr. Willock has prepared a detailed, illustrated, 11-page patient education paper offering a brief overview of the effects of dental amalgam on the teeth and body—a primer of value to all. A basic problem is that amalgam fillings do not bond to the tooth, Dr. Willock explains. “When mercury amalgam is first placed, it is packed into the cavity preparation in a flexible plastic form and soon turns very hard. And while it is hard and adds strength to the tooth, it begins to leak shortly afterward—due to thermal expansion and contraction—because it is not bonded to the tooth and does not seal it. In essence it is just a tight ‘press fit.’” There are a host of new, safe composite materials now available for the restoration of teeth in need, he says. He notes that dental amalgam is typically a 50-50 mix of mercury and silver with various amounts of tin, copper, and zinc added to give different properties to the mix. “And of course, mercury is the second most toxic element on the planet, after plutonium. It is considered a dangerous material by both government agencies and the medical community, and we must take special precautions to both store it and use it. “Dental amalgam also off-gases continually as we chew, and this vapor is inhaled and absorbed by the body. Some experts believe the reason some patients and dentists are less affected by exposure to mercury is for one of two reasons: fewer incidents of exposure, and the ability to detoxify the substance, through the use of anti-oxidants and chelating agents, and a healthy diet. Cleansing the intestinal tract, keeping the liver and kidneys healthy, using a far infrared sauna, drinking good water to flush the acid radicals out, along with a good exercise program, need to be part of a good health plan.